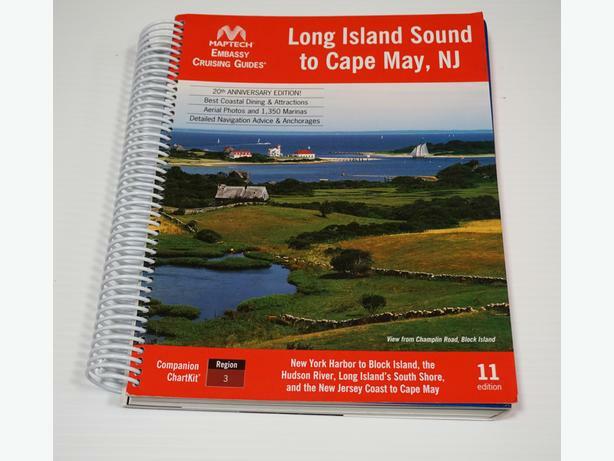 This is a "Long Island Sound, NY to Cape May, NJ" - Nautical Maps and Guide by "Maptech Embassy Cruising Guides" in New Condition. The book has 570 illustrated pages in color and it is spring bound for easy to read on boat. It comprises detailed navigation maps with points of interest such as marinas, pump-out stations, local attractions, etc. It is a beautiful book, a must to have when cruising from the North side of Long Island, NY to Cape May along NJ coast. The route includes: New York Harbor to Block Island, the Hudson River, Long Island's South Shore and New Jersey Coast to Cape May. Navigating the East River you will have the chance to sail below the City's iconic bridges and by the Statue of Liberty and Elis Island. Pick-up from Cobble Hill only.